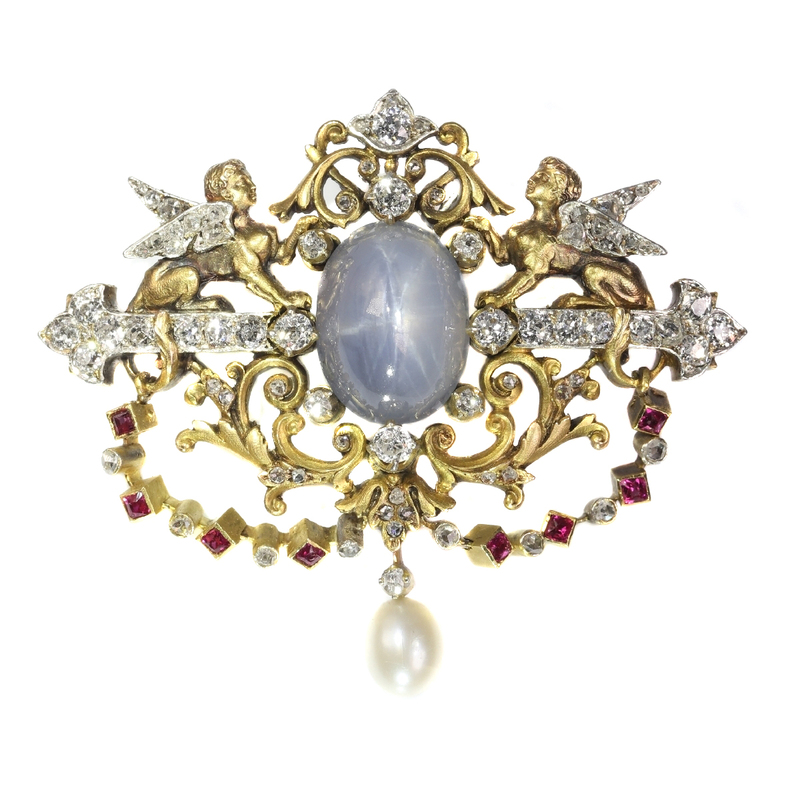 19th Century French brooch two sphinxes diamond set and star sapphire (Freemasonry? ): Description by Adin Antique Jewelry. The centaur - In Greek mythology and art, the centaur has the torso of a human combined with the body of a horse. The cockatrice - this creature was also known as a basilisk ("king of serpents"), and its very glance could kill; the cockatrice was composed of a dragon's tail and assorted poultry parts. The giants (gigantes) - These fierce and frightening beings were the offspring of Gaia (the Earth). The griffin - According to myth, the griffin was a creature with a lion's body attached to the head, wings, and claws of an eagle. The harpy - Harpies had female torsos melded with vulture parts; the name harpy is derived from the Greek word that means "snatcher". The satyrs (faun) - Satyrs were often the companions of Dionysos, and these creatures were depicted in myth and art with the legs of goats and bestial natures. The sirens - Women with bird-like bodies; sirens were legendary for luring sailors by singing their enchanted songs. Diamond(s): 26 old brilliant cut diamonds with an estimated weight of ± 1.12ct. (colour and clarity: G/I, vs/i). 47 rose cut diamonds. We do not have the weight of the diamonds which is normal in our trade when it comes to rose cuts. Precious stones: One star sapphire with an estimated weight between 7ct and 8ct. colour: light blue opaqueness. Treatment: unknown. Birthstones: Diamond is the birthstone (or month stone) for April ruby for July sapphire for September and pearl for June. Master: no trace of a master mark. Although we could not find an indication who the maker could be, we think in the direction of masters such as Froment Meurice, Fouquet, Wièse or Falize.